Colorize console output in dart console apps! 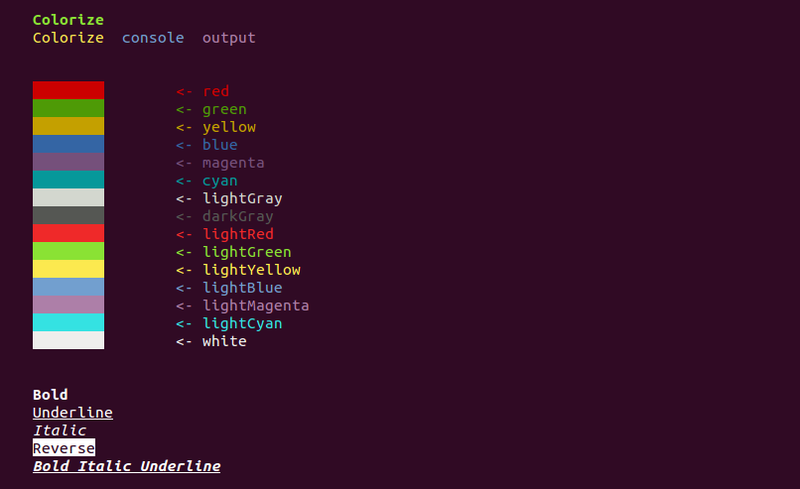 Then you can call methods of Colorize. Top-level function color apply one required parameter - String text. It is text, that would be print on console. Styles front - name of front color (you can also use the constants of class Styles). Default value is ''. Styles back: name of background color (you can also use the constants of class Styles). Default value is ''. bool isUnderline - default value is false. bool isBold - default value is false. bool isDark - default value is false. bool isItalic - default value is false. bool isReverse - default value is false. No platform restriction found in primary library package:colorize/colorize.dart. 96 out of 96 API elements have no dartdoc comment.Providing good documentation for libraries, classes, functions, and other API elements improves code readability and helps developers find and use your API. line 6 col 21: Use = to separate a named parameter from its default value. line 7 col 16: Use = to separate a named parameter from its default value. line 8 col 16: Use = to separate a named parameter from its default value. line 9 col 18: Use = to separate a named parameter from its default value. line 10 col 19: Use = to separate a named parameter from its default value. Run dartfmt to format lib/colorize.dart. Run dartfmt to format lib/src/colorize.dart. Common filename patterns include main.dart, example.dart, and colorize.dart. Packages with multiple examples should provide example/README.md. 1 image link is insecure (e.g. http://i.imgur.com/BaxDbw9.png), use https URLs instead.